Most Homeowners don’t think about carpenter ants until they discover wood deterioration on their home. Several times a year we receive inquiries from Customers in Northern Virginia, who want to resolve peeling paint issues on their exterior trim. Many times the peeling paint is just what is visible on the surface. 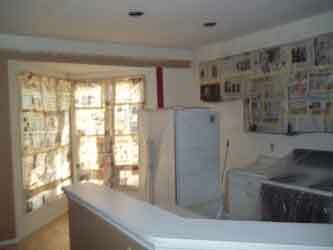 Once this peeling paint is blasted off, we often find wood deterioration that is commonly caused by carpenter ants. Carpenter ants usually establish their nests within the wood itself that is located in a moist and humid environment. They also seem to favor wood that is hollowed out, so that they can establish their nests. Our most recent project for the month of December was built 20 years ago in Vienna, Virginia. This Client had extensive carpentry requirements, and we surprised to learn that almost all of the lower window sills needed to be replaced. This home had the original wooden windows that are not made anymore. All of the window sills, frames, and other parts were basically hollow. Also, the rear façade of the home faced several acres of woods, as well as, a running creek that was less than 100 yards away. That being said, the back of the house was constantly wet and muddy. This was the perfect breeding ground for carpenter ants, and we discovered an entire window sill that had been completely devoured by carpenter ants. Carpenter ants are different than termites because they don’t actually eat the wood. They excavate the wood by carving out intricate hollowed-out canals which can extend several feet. One way to know the difference is to examine the destruction that is left behind. 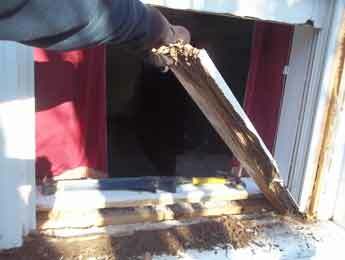 We found about four inches of what appeared to be sawdust underneath the deteriorated window sill. This sawdust pile was actually made from the shredded fragments of wood that were ejected during the ant’s excavation process. In more serious situations, these carpenter ants can hollow-out the house framing or even structural beams, which would eventually weaken them and cause a structural failure. Even though these pests can cause considerable damage to a house, they are actually considered to be beneficial insects. In the forest these insects are essential for their excavation work because they help accelerate the decomposition of dead trees. One thing that you should do if carpenter ants are eating your house is to locate the nest. In most cases the carpenter ant nest will be located outside of the house structure, in a place where there is abundant moisture. They almost always prefer to set-up their nests in rotted wood that is easy to excavate, but eventually they will expand out into wood that is not decayed. Usually a pest control service operator will be able to develop a strategy that would eradicate these pests in an effective and safe manner. Another important step to ensure that carpenter ants stay away is to eliminate the conditions that allowed them to invade your wood trim in the first place! Our Carpenter at Davinci’s Painting stays very busy throughout the year replacing deteriorated wood trim. In fact, one sure-fire way to eliminate wood deterioration in the future would be to replace that worn-out trim with PVC Composite trim. You should also check your downspouts and gutters for water leaks that could cause wood damage. In addition to painting, we also specialize in wood trim replacement, structural repairs, insect damage repair, and home restorations. Please call or click Davinci’s Painting for more information and a free carpentry consultation. At Davinci's Painting, we scale great heights! This photograph shows one of our Carpenters on top of a very high roof of a luxury townhome. This townhome is part of the Fenwick Court Subdivision and is located in Arlington, Virginia. Throughout the month of October, our company is in the process of replacing extensive portions of the exterior trim for about 5 townhomes within this community. 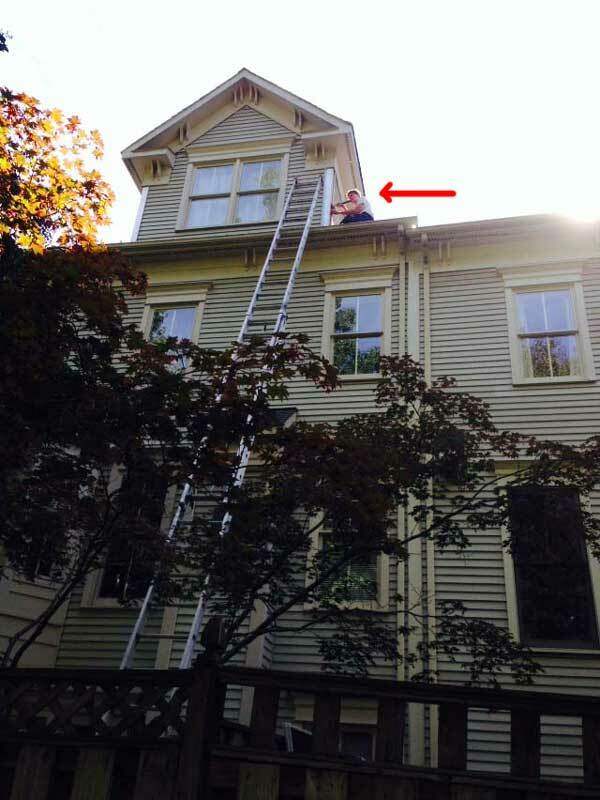 Several of these jobs feature dormer windows that are four stories high. All of these projects will continue to require the use of a 48 foot extension ladder, as well as, safety harnesses in order to adequately ensure worker safety. Prior to starting any exterior project, we first scope out the job to determine the type of equipment and ladders that will be needed, as well as selecting fall protection processes that are compatible with the type of work that will be performed. In some cases, we even have to identify and evaluate fall hazards that could occur while working indoors on high ceilings and stairwells. It is very important that every employee be supported by a harness, if they are performing work on a ladder that is greater than 32 feet. Safety is an important consideration in construction related fields like painting, because of potentially dangerous working conditions. Providing safety equipment and harnesses isn’t everything, we are also very diligent and our Painter Foremen are constantly alert on the job to be sure that adequate safety practices are being followed. Our employees also have a responsibility for themselves, their fellow workers, and the home owner’s property. We value our employees and we want them to return to their home every night, safe and uninjured. We are really proud of our safety record and we have never had a serious workplace accident within the 30+ years that we have been in business. The benefits of maintaining a safe work environment is primarily undertaken in order to protect the painters and our clients’ property. A safe work environment impacts our project’s bottom line. Not only does this help boost our employee morale, but there are also fewer schedule interruptions due to incidents. Moreover, the implementation of good safety protocols has also advanced our company’s reputation. Davinci’s Painting is a long standing employer in the commonwealth of Virginia. We carry both General Liability and Workman’s Compensation Insurance. Please check out the Safety Page of our Website for more information about our Safety Facts and Policies. 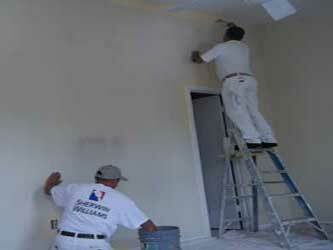 When painting indoors, our initial activity will always consist of implementing protective procedures. Our biggest responsibility is to protect your home and everything within it. As a Customer, you are inviting us into your home to help you, and we recognize that we need to pay careful attention for the work activities that we do. We treat your home as if it were our own and take extra care when moving your furniture and belongings. As a painting company in Northern Virginia, we are often praised on our professionalism and extensive prep work that we undertake to ensure the highest level of protection. Some Customers ask us why we go to such great lengths using so much tape and plastic. My answer is simple. It ensures 99%protection of surfaces, and helps us complete the application much faster. By completely taping and putting plastic over cabinets, counters, bathrooms, and floors, we do not need to cut-in these areas. Following the plastic seal protection, we layout clean, interior painting-only drop cloths throughout the floor space of where we will be working.If we are working over hardwood floors and stairs, we take even more precautions by laying out durable rosin sheathing that protects the hardwood from impacts and scratches. An ounce of prevention is worth a pound of cure and we think that this is a very important component of protection and containment for any kind of paint or drywall application. Our skilled mechanics will also move the furniture to the center of the room and cover it with protective plastic. Additionally, we will remove items from the walls, including electrical plates and bathroom fixtures, and store them for safekeeping.Curtains and blinds are temporarily removed from the walls and protected. We will then inspect the area one final time to see if anything else needs to be removed or if anything requires additional protection. When we are done, everything gets put back to its proper place, we sweep and vacuum all your floors, and wipe down your counters where wherever we have been working. Our jobs always end-up cleaner than when we first started the work, and there is never any trace that we were even there. Except for the fact that now you have beautiful new colors on the walls throughout.